LSU researchers have discovered a new relationship between climate change, monarch butterflies and milkweed plants. It turns out that warming temperatures don't just affect the monarch, Danaus plexippus, directly, but also affect this butterfly by potentially turning its favorite plant food into a poison. Bret Elderd, associate professor in the LSU Department of Biological Sciences, and Matthew Faldyn, a Ph.D. student in Elderd's lab from Katy, Texas, published their findings today with coauthor Mark Hunter of the Department of Ecology and Evolutionary Biology and School of Natural Resources and Environment at the University of Michigan. This study is published in Ecology, a leading journal in this field. "A lot of global climate change research focuses on a single species, and how that species will be affected by climate change," Elderd said. "But we know that in reality, species interact, and they are often tightly linked together." "We wanted to explore how species interactions, like that of the monarch and the milkweed, change with climate change, or the indirect effect of climate change on monarch butterflies through the plants they eat and lay their eggs on," Elderd said. "It's important to understand how changes mediated through milkweed impact monarch butterflies," Faldyn said. There are several different species of milkweed, but they all share a common trait. They produce toxic chemicals in their leaf tissue called cardenolides that deter most vertebrate predators. These chemicals are in the class of cardiac glycosides that interfere with sodium potassium-pumps in the heart and other tissues, and can even affect humans if ingested in large quantities. 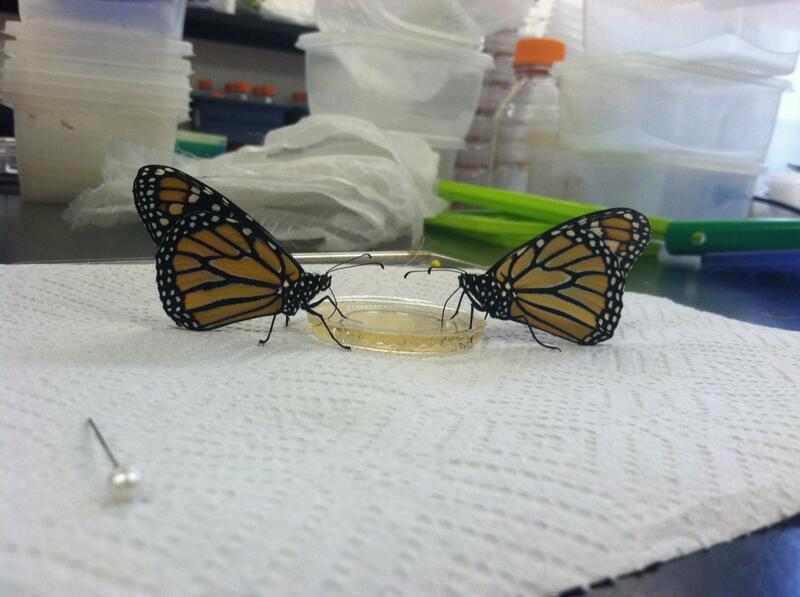 Monarchs, however, have evolved to become cardenolide-tolerant up to a certain point. By laying their eggs on milkweed plants that contain levels of cardenolides that are toxic for their predators, monarchs protect their caterpillar offspring from being eaten. After hatching and chowing down on milkweed leaves, the caterpillars are full of cardenolides that make them taste nasty to most predators, such as birds. Monarch butterflies also sequester this compound in their wings. Their contrasting bright orange and black wings signal "do not eat me" to birds such as blue jays. But if a milkweed plant produces too much of this toxic chemical, caterpillars that feed on the plant's leaf tissue may inadvertently poison themselves. "It's a Goldilocks situation for monarch butterflies. Too few of these chemicals in the milkweed, and the plant won't protect monarch caterpillars from being eating," Elderd said. "But too high of a concentration of these chemicals can also hurt the monarchs, slowing caterpillar development and decreasing survival." The trick lies in monarchs finding a milkweed species that is just right in terms of the amount of cardenolides it produces. In the southern U.S., this ideal species turns out to be the invasive milkweed A. curassavica, as known as "tropical milkweed," which is commonly sold in gardening stores. "A. curassavica is hardy. It holds onto its leaves longer than most other species, and it flowers throughout the year making it attractive to gardeners and homeowners," Faldyn said. The plant is often sold to homeowners with a catchphrase such as, "Beautify your Yard, Save the Butterflies." And monarchs do love the invasive A. curassavica. In fact, under current climatic conditions, adult monarchs that feed on this species of milkweed demonstrate a higher survival rate and weight. That's because A. curassavica contains the perfect amount of cardenolides – just on the edge of too much. But environmental conditions that increase cardenolide levels in this plant, such as warmer temperatures, can set up an ecological trap for monarchs. As this plant senses rising temperatures, it produces more cardenolides, perhaps as a defense mechanism. Temperature-dependent increases in cardenolide concentrations in A. curassavica, which Elderd and Faldyn observed in the field within three days of placing tiny greenhouse-like structures around these plants, push monarchs over a tipping point, poisoning their larvae, delaying larval growth and leading to butterflies with stunted forewing length. In essence, with climate change, too much of a good thing becomes a bad thing, specifically when it comes to the tropical milkweed plant. The native A. incarnata milkweed naturally produces fewer toxic chemicals than the tropical milkweed, but warmer conditions don't radically change these levels. Under conditions of global warming, monarchs feeding on the non-native milkweed fare much worse in terms of growth and survival than monarchs feeding on native milkweed. "If I'm a monarch butterfly, and I'm responding to past environmental conditions, I'll lay my eggs on A. curassavica," Elderd said. "But under conditions of global warming, I'll be doing my offspring a disservice without knowing it." The warming conditions Elderd and Faldyn applied to milkweed plants in the field mimic temperatures projected to occur in Baton Rouge, La. within the next 40 years or sooner. If for example, there's a heat wave. "It has become increasingly recognized that species interactions, especially interactions between tightly-linked species, need to be considered when trying to understand the full impacts of climate change on ecological dynamics," wrote the authors. Unfortunately, invasive milkweed plants are everywhere throughout the southern U.S. Faldyn hopes to raise awareness among plant sellers, gardeners and home owners that given global climate change, it's better to plant the native milkweed rather than the pervasive, non-native tropical milkweed plant for the monarchs.